almost finished with this one, I now only have 3 quilts in progress (yay!) counting this one, and I'm finished with the quilt top of another one. I really need to get some batting, so I can finish them! are my kids the only ones who can't stay off a quilt? As soon as I lay it out, they dance (or drive) all over it. Awww mom, they just love them! :) What a little doll! I love his footie PJ's. I love all these fabrics. I have a lot of them, but see a few I wish I had. Beautiful. Oh it's gonna be a pretty one!! And no kids for me yet but my cats seem to have the same tendency as your children. All living things love a quilt on the floor! Ha! and yep, my kids do the same thing when i have the quilt top layed out. i usually try and do it when my 18 months old is napping since there is no way to keep him off. Pretty! I love the white and blue! i think it's a kids thing. my kids ALWAYS attack a quilt laying on the floor. no matter if i threaten them or not. and yayyy to only having 3 quilts in progress!!! Um, yes my kids instantly walk on any piece of fabric/project that gets laid out on the floor, too. I wonder what the appeal is?! 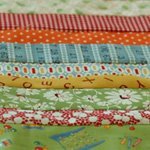 Pretty colors in your quilt! I love it! The colors make me think of robins, their eggs & spring. I love it! This quilt is looking great. Beautiful! The same thing happens around here. Where there is fabric there are kids. Where there is yarn there are kids. When I need a moment to measure there are kids. The older ones are getting the hang of it now days. They will even chastise their younger sister (15 mos.) if she wanders near the sewing machine or knitting basket. They of course have their own supplies (fabric, yarn, etc.) to play with, but mine seem to hold infinitely more appeal. Great quilt! Congrats on the top. At least the quilt top is pieced, if it weren't you might have a whole different layout. Love the quilt top. If you had a cat or dog they would be right there on the quilt too. Wow! This is gorgeous! And fun - no wonder your kids can't stay off of it. Can't wait to see the finished product. This one is a real beauty. There's no way my kids would keep off it if I laid it out at home. My daughter thinks quilts are instant tea party places. My son makes every one a train track. This one is really amazing - every time I think you've made the best quilt ever you make an even cooler one. Love it! For me, it's not that the kids are all over it, it's the CATS. yep. my kids do the same thing. there's just something inviting about a quilt, or anything, all layed out. LOL, my daughter does the same thing. She loves to dance or lay on them. This quilt is great! I love that the squares are all different sizes! and i love my kids uncontainable excitement for a new quilt that forces them to rush in and explore the new work of art. That aqua and red is really growing on me. Too cute. The quilt is beautiful and we have that same bus! Awesome. This looks great! Love the colors and the design is fun and modern. I can't say about the kids, but quilts on the floor seem to have the same effect on dogs and cats in my house. My daughter does the same thing! 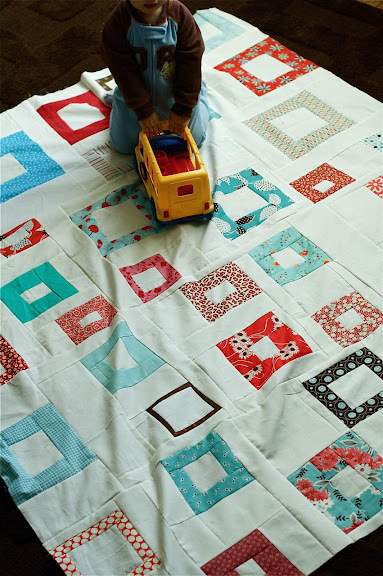 As soon as a quilt top is complete, she whisks it off for a nap or cozy snuggle or picnic blanket...go figure! I'm glad not the only one who runs out of batting. My two dogs love to lay on my quilt tops as I lay them on my sewing room floor!! One of them is blind so it's understandable when she does it. But our younger dog (3) loves to be smack dab in the middle of every one if on the floor!! Ooh tell me about it. It is almost impossible to lay a quilt out in this house. My cat or my girls start rolling on it. And in one terrible occasion my toilet training little girl piddled on one. Now I am very careful when and where I lay the quilts out! So fresh! Love that turquoise! Hey, i'm giving away fabric on my blog today, you should come check it out! Just click on my name above. This is so great! I love the random placement of the blocks! Great colors, too! my little one's do the same thing! They just want to know what been occupying me :) Love your quilt top - lots of fun movement! so cute! as soon as i lay mine on the floor my dog is on top of it...the ultimate quilt tester! No, you're not the only one. I think I need a design wall to put my quilts up on. My 2 year old is all over any quilt I lay on the floor or on a bed! Nice job on this quilt!! My cats love quilts on the floor. They will inevitable come and roll around on them leaving me crawling over the quilt with the lint roller. i'm so impressed. only 3 quilts in progress??? i have 10. i'm working my way to 8 or 9. hopefully soon! your quilt is LOVELY!!! i'm lovin' those colors. Love it, Nettie! I've decided that after I finish my coin quilt I am doing an aqua and red one. Currently I am only a one quilt at a time girl! My quilting bee buddies where surprised about my son walking around a lay out on the floor instead of over it... If the layout has gaps, he will try to make paces on these... He is a very sweet kid and almost 6, so trained for years! But I might have been very angry before, I don't recall ;-). in our house it's the cat who cannot stay off them.